Unfortunately Mother Nature really dumped on us this past weekend when my husband typically takes outfit photos. It rained all day Saturday and then snowed all day Sunday and Monday. 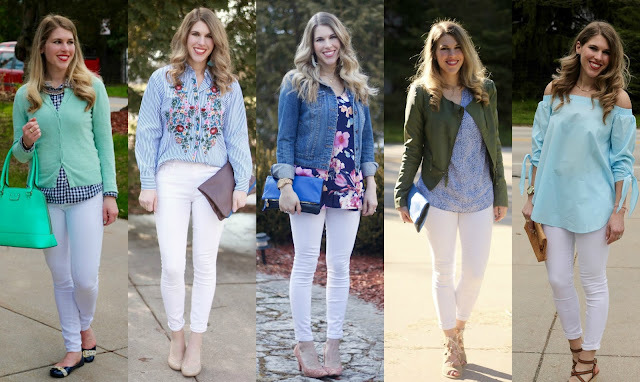 So, today I thought it would be fun to take a look back at my favorite spring outfits! I hope this provided some inspiration for you this spring! It was fun to search through the archives and pick some of my favorite looks. And once our snow melts (again) and weather warms up I look forward to wearing some these outfits again! If you haven't already, make sure you enter my Alison + Aubrey giveaway from last week! You still have a few more days to enter. You can also use code LAURA15 through April 30 for 15% off your total order! Last week's most popular post was from Kileen with her friend Trish at Cute & Little sharing her Body Positivity Tips. They both look amazing! so many cute outfits, great roundup! Lovely outfits, we are missing spring here too! All of these outfits are perfect! I'd wear each one! I love your pink coat - I have no real need for one but boy do I love it! I had to cancel my photo shoot too! 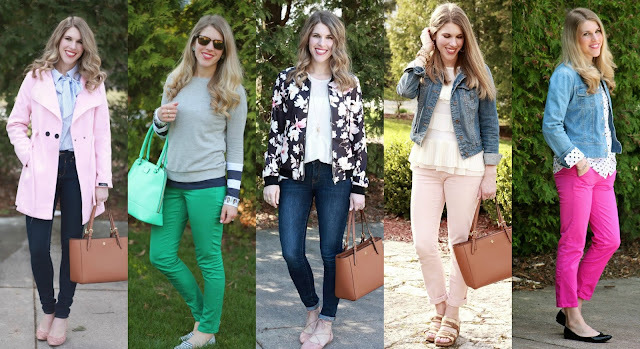 Love all these spring looks Laura and thanks for the link up! This WAS so fun, you gave me so many ideas and look cute in every.single.outfit!! Spring dressing and Mother Nature's elements can be tough so this was great!! so many cute spring looks. I am so ready for lightweight florals and pastel colours. Easy layers like these are my favorite too! Of course this spring has needed a little heavier pieces and my closet is confused..ha! Happy Tuesday Laura! Hope the weather improves for you soon! I love all of the color you embrace Laura!! Such gorgeous style!!! 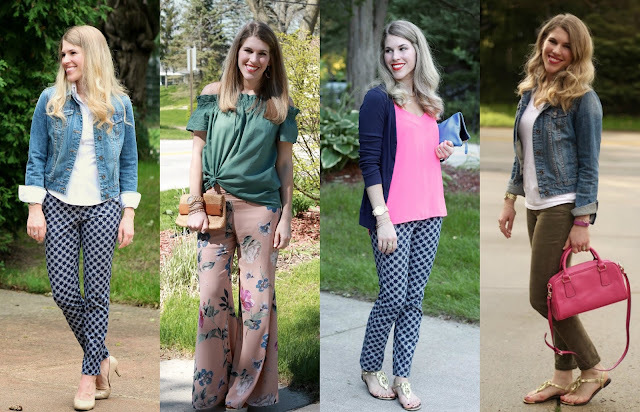 What a great round up of Spring outfit ideas! It's always a challenge to get creative with content when photos don't go as planned, but sometimes it ends up leading to great posts like this. I definitely need a blue top to wear with white jeans! Love seeing these throwback outfit. Hopefully Spring will come soon. So many fabulous outfits many of which I plan to recreate! Great post! So many great spring looks! I can't wait for the weather to warm up, so we can actually dress for spring! So much inspiration here!! I love that white dress so much! Goodness, I am not going to complain about our colder than normal weather. Two days of snow - yikes! That white lace dress is positively gorgeous. I have been looking for something similar, so this really caught my eye. 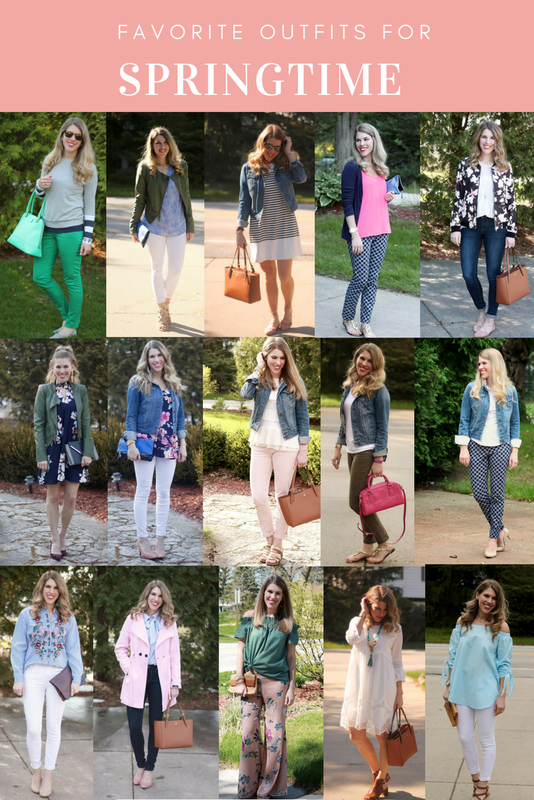 I enjoyed looking through all of your favorite spring looks and gaining some inspiration! so many pretty outfits Laura! I am in love with the white dress you wore. I am looking for a new white dress for summer, and i love the detail. I also love the florals and all the colors. I'm so sorry you have snow there!! I really need some Spring outfit inspo so this roundup is coming at the perfect time. I might need to wear my white jeans this week! Great choices Laura, the dresses are my fave although the coloured denim are also fabulous options. I don't have any printed pants! I love your styles with yours... you've inspired me. I do love colored skinnies and Spring dresses. I sure wish we'd get some nice Spring weather here, this Spring has felt like winter! That striped dress is SO cute! Now if only mother nature could cooperate around here so we can start wearing our spring clothes! Fabulous looks! What a nice round up! 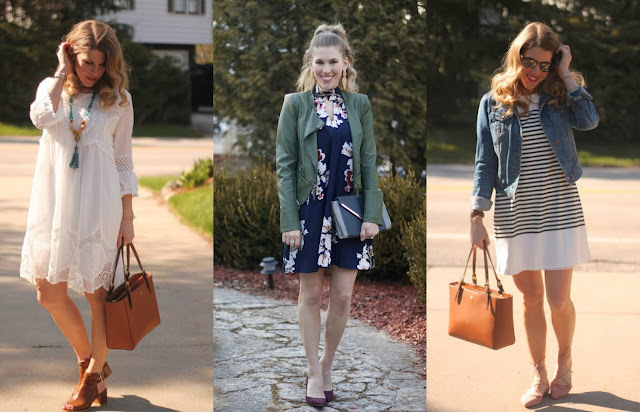 So many gorgeous spring looks! It snowed for 3 days here in northwest Wisconsin too. Did you know this was the coldest spring on record for us? UGH! Well, if we can't have spring, we can look back on it as you did in this post. I always enjoy scrolling back through the archives. Those blush skinnies are my favorite! These are all such cute looks. Love the cute dresses and how you styled the white jeans each time. My favorite outfit is the one with the floral palazzo pants - I have missed that one from last year. I love that first floral dress on you with the green jacket. It's such a perfect, elegant look for spring! You know how to dress for spring! I love how you styled each look! I love your round up of Spring dressing! You look so pretty in each one and I love your style - always so chic! You and Sarah, at Foxy's Domestic Side, just have to show up with your grand smiles and the rest is icing on the cake. All of your springtime looks are spot on. But do you have one that is your particular fav? Would love to know. I appreciate your reminder that we need to be confident in what we are wearing. I really think that is half the battle. Hoping sunny skies and spring temps have found their way back to you! So many cute outfits—now if only the weather would cooperate! 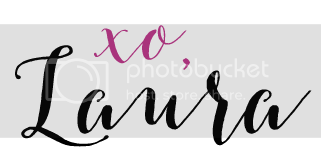 I'm cohosting a linkup today and would love to see you stop by! This was a fun post. Each look that you shared was so stylish, from the dresses to white jeans paired with cute tops. Cute outfits dear, especially that pink trench coat. Such a pretty look! Such a great collection of outfits!!! Such gorgeous Spring outfits Laura! I hope the weather has improved for you, thanks for linking up!